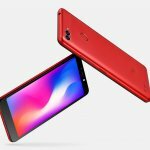 Itel mobile; having successfully launched 3 new smartphones in 2018 felt it wasn’t enough to end the year 2018 with just 1 of its smartphone belonging to the selfie family. They saw the needed to launch another selfie-centric smartphone just to add up some few things. They introduced the Itel S33 as a clearer selfie android phone on a budget. If you think the Itel S13 has the best selfie camera yet on a budget smartphone in Nigeria, I suggest you try the Itel S33. The Itel S33 is undeniable the best smartphone have seen from Itel mobile ever since her inception. 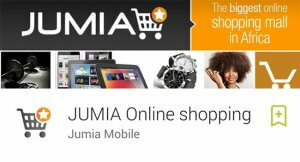 Gone are the days when people use to underrate Itel smartphones. 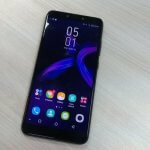 Ever since the company announced the arrival of her first android smartphone with Android 8.0 Oreo operating system, I knew they were preparing for something big. With Itel mobile working tirelessly to produce affordable devices that are worth your cash, they are also making sure they throw in features an average smart user needs. One of such feature is face ID which happens to be the first of its kind on an Itel android smartphone. Without talking any further, let’s dive into the full section of this review. In Nigeria, the Itel S33 is available in the following colors; midnight black and champagne gold. It is selling at an affordable price. The design of the Itel S33 looks very flexible even though it didn’t spot a notch at the top. 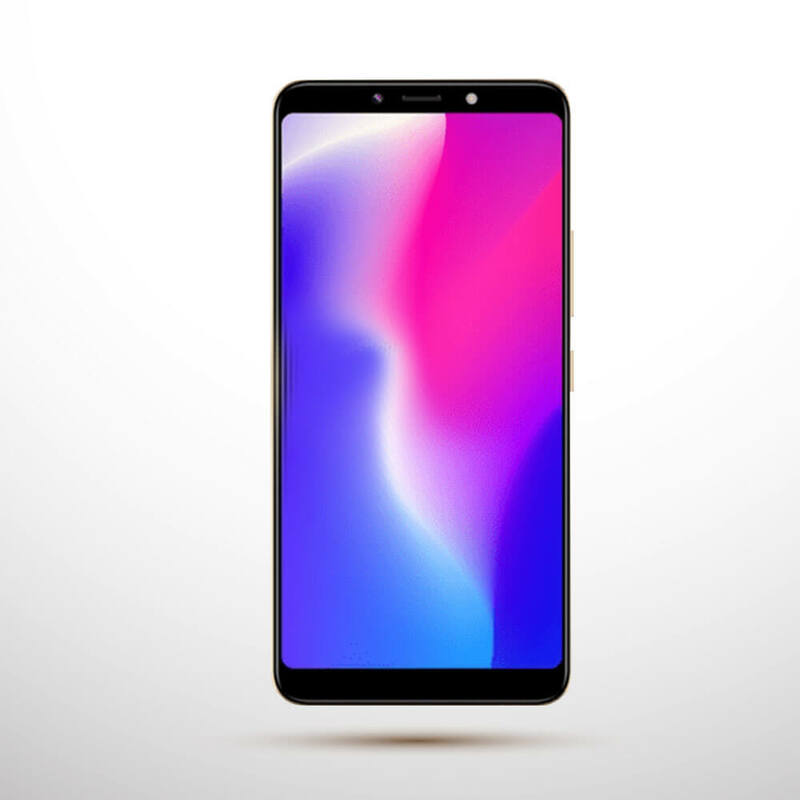 Am not really a huge fan of notchy designs but I think it will be very good if Itel mobile will try something new in 2019. The design of the Itel S33 is nothing more than what we saw on her previously launched Selfie-centric smartphone in Nigeria. Yes, the Itel S33 looks very identical to her last ‘S’ series smartphone (S13) but this time is of larger size. The Itel S33 comes with a body that is made of plastic, uses duals micro sim cards with additional slot for micro SD card. The micro USB port is at the bottom and the 3.5m headphone jack is at the top. 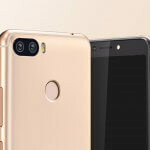 The fingerprint reader, down-facing speaker and camera sensor are positioned at the rear of the Itel S33 while the receiver, selfie camera and flash are placed at the top bezels in front. The Itel S33 boost a 6.0 inch HD+ IPS full display. It has tiny bezels that gives room for more display. The massive display provides immersive experience with adaptive brightness and blue-ray eye protection. With blue-ray eye protection, you can save guide your eyes by activating it. When activated, you will notice that the screen color on the display will change from white to milk. If you want your Itel S33 to behave like an Iphone, you can turn on the smart gesture. This feature automatically take off the nav on-screen buttons on the Itel S33. With smart gesture, you can quickly customize up to 11 gesture to different shortcuts. You can use it to activate a specific application or even draw a “C” on the screen to launch the camera. To make your Itel S33 look unique and work differently, simply locate smart gesture swipe on the Itel S33 by heading straight to settings and tap I-smart on the menu list options. When it comes to camera, the Itel S33 is really motivating. With the number of social engagement increasing every day, many wouldn’t mind buying a Selfie-centric Smartphone in Nigeria. On the Itel S33 is a 13MP front and 8MP dual rear cameras with LED flash light. The Selfie camera can be used to take sharp and beautiful portrait shots with perfect blur effect. Whether in the day or at night, utilizing the Selfie camera won’t be disappointing at all. This is because there is a front flash that helps in low light condition. Also on the Selfie camera is a face beauty 2.0 set up that helps to make your face appear thin, rude and smooth after taking Selfie shots. The dual 8MP rear cameras on the other hand comes with 4 in 1 pixel unit. This feature allows each pixel to be form into one big pixel in order to absorb more light. You can use the dual rear cameras to take high quality portrait shots with stunning background. You can even use the Pro mode feature on the camera to adjust the parameters and get your desired photo effect. The Itel S33 comes with an entry-level 3000mAh battery that is enough to power the phone at least for a whole day on heavy usage. You can spend as much time taking countless number of Selfie shots and be rest assured that the battery will scale through. You can even decide to apply some custom power saving features so as to prudent with power consumption and boost battery life. 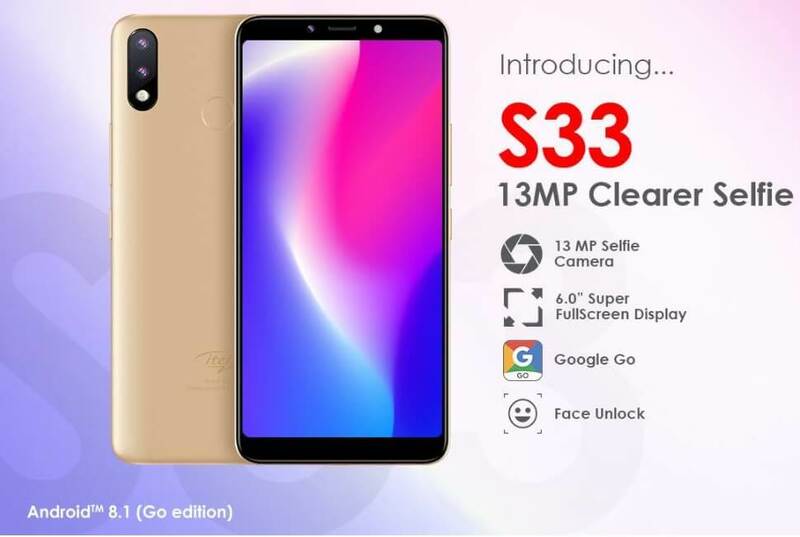 The Itel S33 is an Android phone, it comes with Google Android 8.1(Go edition) which has some pre-installed Google apps like Google Go and YouTube Go in it. The Itel S33 comes with a mediaTek MT6580 chip and runs on a 1.3GHz quad-core processor. It also comes with a 1GB RAM and 16GB ROM which is expandable (up to 32GB) via micro SD card. Itel mobile have taken security more seriously this time. They’ve decided to throw two main security features on her S33. On the Itel S33 there is a fingerprint sensor and facial recognition to choose from but am going to be shedding more light on face ID since this is the first of its kind on an Itel smartphone. The face ID feature on the Itel S33 is really fast. This feature capture your face and unlock at a glance but I wouldn’t recommend you use this as your number one security feature. 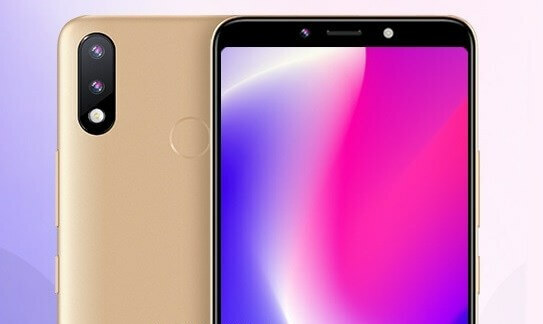 That said, the fingerprint scanner can be used to do many things like unlock the Itel S33, unlock and launch apps, take photos, record videos, answer phone calls, stop alarm etc. Just in case you decide to do it the old way and stick to the traditional enter password and pattern lock security feature, the Itel S33 still have that in stock too. The Itel S33 is another excellent tech piece from Itel mobile, it does seem to have majority of the features an average user expects from a smartphone in Nigeria. Aside boosting an excellent camera and trendy safety features, the Itel S33 didn’t forget to smooth things up with battery life but you should remember that the Itel S33 was built for camera. If you really want to upgrade to something premium from Itel mobile in Nigeria, I suggest you start the Itel S33. Seriously am impressed the way, u clearify issues. Keep it up. 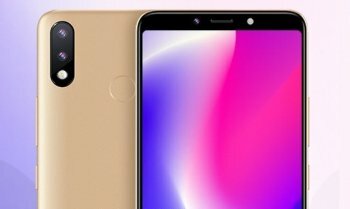 Previous Previous post: Itel S13 – The Cheapest Selfie Phone Yet?